1. Using a Pasteur pipet, transfer an aliquot of embryos from the Blocking Buffer tube to a fresh 1.5-mL microfuge tube. Allow embryos to settle and draw off excess Blocking Buffer (see Note 21). Fig. 1. Setup for manual devitellinization. Place a piece of doublestick tape on one side of a 60 x 15-mm Petri dish. Embryos in a drop of heptane should be dropped onto the tape with the heptane quickly blown away to spread embryos as shown, followed by rapid addition of PBST to minimize the dissolving of the tape glue by the heptane. When done properly, gentle pressure will cause the embryo to pop out of its vitelline case, leaving the membranes stuck to the tape. Gentle swirling of the Petri dish will bring the devitellinized embryos to the middle of the dish for easy retrieval with a "precoated" Pasteur pipet. 2. Prepare 1 mL of primary antibody solution by diluting desired antibody into antibody dilution buffer, add to embryos, and rotate overnight at 4°C (see Note 22). 3. Allow the embryos to settle to the bottom of the tube. Use a Pasteur pipet to draw off primary antibody solution, rinse briefly with 1 mL of PBST, then wash 3 x 10 min in PBST at 4°C on a rotator. 4. Prepare 1 mL of HRP-conjugated secondary antibody solution by diluting the appropriate secondary antibody (see Note 23) into antibody dilution buffer, add to embryos, and incubate for 2.5 h at 4°C on a rotator. 5. Allow the embryos to settle, remove the secondary antibody solution, rinse briefly with 1 mL of PBST, then wash twice for 10 min in PBST at 4°C on a rotator. 6. Allow the embryos to settle, draw off the wash buffer, rinse briefly with 1 mL of PBS, and then wash twice for 10 min in PBS (see Note 24). 7. Prepare substrate solution by adding 10 |L DAB to 1 mL PBS. (Minimize exposure of DAB to light.) Just before use, add 1 ||L H2O2. 8. Remove the final PBS wash and incubate the embryos in the substrate solution 5-10 min at room temperature on a rotator. Development of a brown precipitate signal can be monitored under a dissecting microscope if desired. 9. Allow the embryos to settle, transfer the DAB solution to hazardous waste collection, briefly rinse the embryos with 1 mL PBS/0.05% sodium azide, then wash once for 10 min in PBS azide. 10. 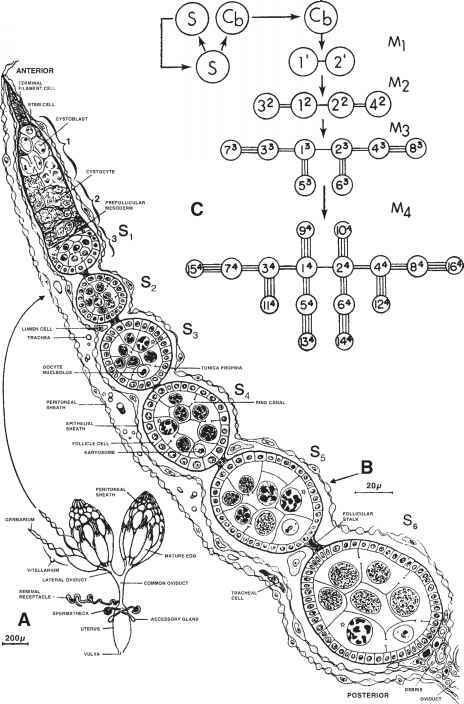 Mount the embryos as described in Subheadings 3.5. or 3.6. (see Note 25). Results using this approach are shown in Fig. 2. Fig. 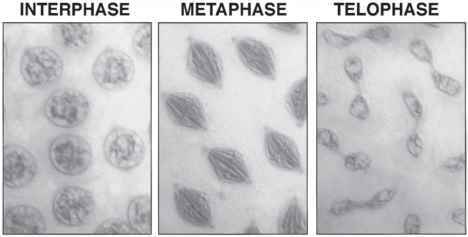 2. mAb 2A labeling of Drosophila embryonic nuclei representing different stages of the cell cycle, including interphase, metaphase, and telophase. The mAb 2A was detected using an HRP-conjugated secondary antibody as described in Subheading 2.3. HRP detection in conjunction with Nomarski microscopy as shown here reveals additional textural details of the structure identified by the mAb 2A. 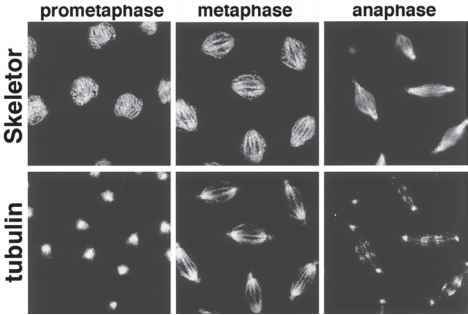 For example, at metaphase the mAb2A can be observed to label centrosomes, spindle matrix fibers, and chromosomes lined up at the metaphase plate. of the primary antibodies into Blocking Buffer for simultaneous incubation (see Note 26). 2. Prepare the appropriate fluorochrome-conjugated secondary antibody by dilution into antibody dilution buffer (see Note 27). Push the diluted secondary antibody solution gently through a syringe filter, taking care to not introduce bubbles into the filtrate (see Note 28). 3. Add the diluted secondary antibody solution to the embryos, cover the tube with aluminum foil to shield tube from the light (see Note 29) in this and subsequent incubations, and incubate 2.5 h at 4°C on the rotator. 4. Follow steps 5 and 6 of Subheading 3.3. (see Note 30). 5. Add 1 mL of PBS containing 0.2 |g/mL Hoechst and rotate 10 min at 4°C. 6. Rinse briefly in PBS, wash once for 10 min in PBS, and mount as described in Subheading 3.5. The results using this approach are shown in Figs. 3 and 4. 1. Pick up the antibody-labeled embryos in a Pasteur pipet and dispense onto a microscope slide. Place the bore of the Pasteur pipet flat against the slide and aspirate off excess PBS (see Note 31). The embryos will be drawn toward the pipet but will remain on the slide. Blot off excess buffer if necessary with a Kimwipe but do not allow the embryos to dry out. Fig. 3. Double labeling of Drosophila embryonic nuclei using confocal fluorescence microscopy in three stages of the cell cycle. The mAb 1A1, an IgM that recognizes the spindle matrix protein skeletor, was detected by TRITC-conjugated anti-mouse IgM secondary antibody. A commercially available anti-a-tubulin antibody, an IgG1 (Sigma-Aldrich, T-9026), was detected by FITC-conjugated anti-mouse IgG1 antibody in order to visualize microtubules. 2. Place two to three drops of glycerol containing 5% «-propyl gallate onto the embryos (see Note 32). Gently spread the embryos with a 200 ||L pipet tip so they are not piled in one cluster. 3. Gently place a 22 x 40-mm2 No. 15 cover slip onto the embryos, taking care not to trap bubbles. Seal the edges with nail polish (see Note 33.). 4. Image the embryos immediately using a fluorescent microscope or store in slide boxes at -20°C in the dark for fluorescently labeled preparations or at either -20°C or room temperature for HRP-labeled preparations (see Note 34). 2. Dehydrate the embryos through successive extractions with 1-mL of increasing concentrations of ethanol as follows: 10%, 50%, 90%, and two washes of 100% ethanol (see Note 37).